Diari Si Tukang Padam Papan Putih: Love does not hurt.. 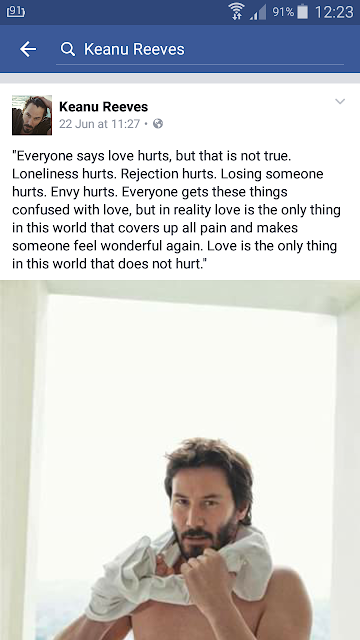 I come across this quote from Keanu Reeves.. I find it true.. and I realised that I had to agree on this with him.. When you love someone.. you tend to be emotional..and sometimes you're out of your imagination to wanting something where in reality we knew that wont be happening now.. but yeah.. in future we never knows.. Allah will decide if that is the path that we would follow thru.. However later on we did agree on 1 thing... that whatever were said... whatever were the questions.. how many questions in the list and all the unanswered questions... Love will always be there for us.. in our heart.. in our soul.. in our mind.. it always.. and always be as it is.. for how long.. for how much... as far as the heart could still feel it happiness... as far as it make you feel good and smiling... as far as it will always make you feel wonderful.. there will always be a special place in your heart that you would place that love.. for you to revisit or to think about when you feel blue.. or when you miss him/her later... eventhou you might have lost the person for good... or both of you have to take your own turn and go separate ways.. I have thought about ending it sometimes.. yeah.. I did have that kind of thought once a while... just to check my own intention... just to question myself how far could I go with my life... but it always ended up that I'm not that brave enough to do that.. eventhou that kind of thought was sort of an option to get out... I know making this kind of decision is not easy.. I have few friends that have to face death and separation in life.. its hard.. its difficult.. its heart breaking.. its sad... its depressing.. its challenging... A friend did question me.. Would I want to end that? I find it hard to say 'yes' because I don't really give it a serious thought... its easy to give a suggestion.. but doing and making it final not as it sound... Love may has prevent me doing it... because Love is what keep me going.. love keep me feel alive.. and love keep me feel wanted.. I too have face so many failure in love.. mostly had sad ending... its still sad to recall each one of it.. but I learn from that experiences... I used to blame myself on what happen... but I do understand love and relationship take two to make it works... it wont works just 1 way... if you're not destine together just move on... but of course the feel of sadness... the blame should be put on someone.. I used to feel that I was the one who did something wrong... but later a friend mention... 'No... both are you not meant together that is... deal with it' but ahhhh.. you know woman... we tend to be so emotional and started to track piece by piece and all the moments that we had gone thru just to find the glitch.. or some signs that you had been missing somewhere..